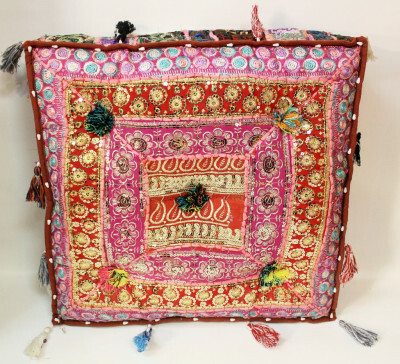 Foot Stool from India. 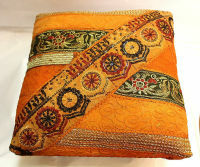 Handmade embroidered fabric with small mirrors inlaid. Elephant Bench. Hand carved Teak wood with embroidered fabric. Handmade in India. 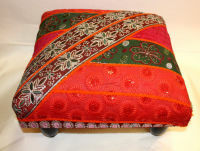 Size: 27" x 12" x 17"
Handmade low seat/foot stool. Very comfortable. Vintage fabric. Size: 13" x 13" x 7"
Elephant Foot Stool. Hand carved Teak wood with embroidered fabric. Handmade in India. Size: 16" x 12" x 15"
Turquoise color ottoman - storage box. Moroccan Camel Stool. Handmade using real leather (with hand embossed design) and solid wood. 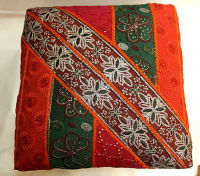 Floor Pillow from India. Handmade, vintage fabric. Gray color ottoman - storage box.